Food Pricing: The food is priced per person or per pan and will depend on the specific menu chosen. This charge includes generous portions of all the items listed on the menu packed to go or displayed in warmer chafing dishes upon request. 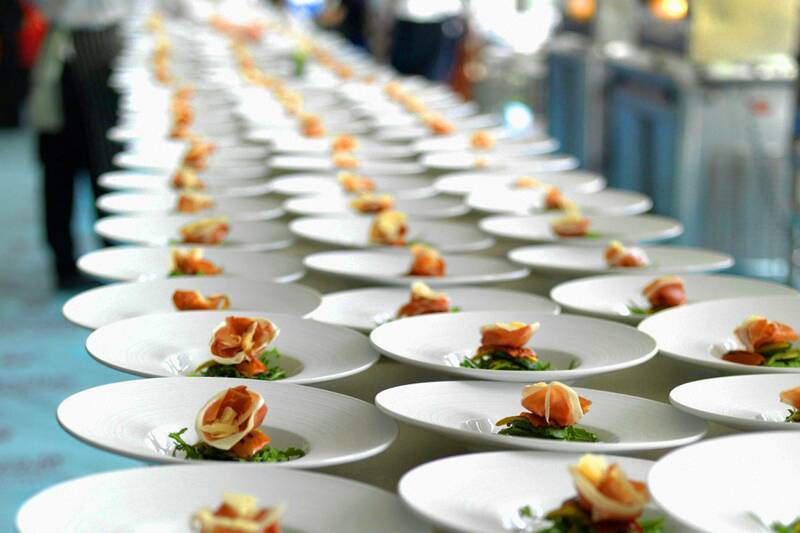 Venue: Norfolk Catering Company can assist you in selecting a venue for your wedding reception. Ask for details. Cake Cutting: There is no cake cutting fee. Our staff will be happy to cut and serve your cake once the bride and groom have had the first cutting. Beer and Wine: We can provide beer and wine for your event and have a variety of selections from which to choose. Beverage Bar- The Norfolk Grille will secure a one day special event license ($100) if beer, wine, or alcohol is being served. Only food or alcohol provided by The Norfolk Grille is to be brought in or allowed to leave the event location.Virginia Licensing laws. Bar Tender - $100 each. Delivery: We deliver to all of Hampton Roads, the Peninsula, and Eastern Shore. Deliveries more than 10 miles from our restaurant may carry a fuel surcharge. Tolls incurred during delivery will be billed to the client. Service Staff: Service Staff and Bartenders can be provided upon request. Please allow at least 72 hours notice if you wish for service staff to work your event to allow for scheduling. Additional charges may apply for service staff and bartenders. Food Tax: Current food tax of 12.5% will be applied to total bill. Gratuity/Transportation: For parties where we provide service staff, we add a charge of 20% of the total food and beverage charge to your final invoice. This charge is proportionally divided between all of the staff who have participated in the planning, preparation, delivery, and service of your party. Rental: We will be happy to give you a quote on rental items for your event. Please note that on all events where we arrange rental, we must also provide service. If we are not providing service we will be happy to refer you to a local rental company. Rental items may include, but are not limited to, tables, chairs, dishes, linens, floral, entertainment, and decor. Rental fees: Banquet Linens - $4.75 each - Certain colored table linens and napkins are available. Disposables: We can serve your catering on disposable or reusable platters and serveware upon request. Contracts: All events require a signed Event Order prior to your event to confirm your details and pricing. Deposit/Payment information: All deposits are non-refundable. Based on your event, we will require a final guest count prior to your catering. Regarding payments, we accept Cash, Checks, Visa, MasterCard, Discover and American Express. Deposits are required at the discretion of management. Final payment is due the day of your event unless otherwise arranged with the management. Cancellation policy: In the event that a party cancels (for inclement weather, etc.) we have the following policy: A party which cancels at least two days ahead of time and reschedules will be charged only for items that are perishable and which have already been ordered and cannot be returned. A party which cancels at least two days ahead of the party and does not reschedule will be charged 100% of the estimate for the party. A party which cancels on the day of the party will be charged 100% of the total estimate of the party. Thank you and please let us know if we can answer any other questions for you.